When chocolate-peanut butter pops want to dress up for Halloween, they do it like this and tell everyone they're Frankenstein's Bolts. Remove pouch from water. Knead pouch 1 min. or until topping is fluid and no longer lumpy. Squeeze topping over mixture in cups. Insert wooden pop stick into each cup. Freeze 3 hours or overnight until firm. To remove pop from cup, place bottom of cup under warm running water 15 sec. Press firmly on bottom of cup to release pop. (Do not twist or pull pop stick.) Gently roll side and tops of pops in sprinkles. 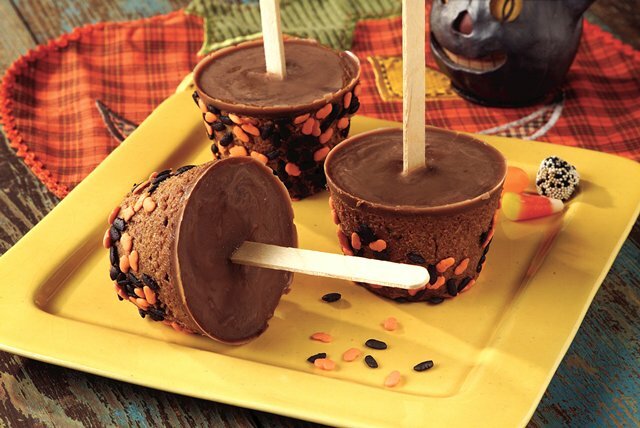 At 8 servings, this makes a great treat to serve at your next Halloween party. Wooden pop sticks are sold at craft and hobby stores.